Does your best friend have four legs and a wagging tail? If so, you’re going to be head over heels for Maxine’s tutorial in this week's flashback! Her layout has a fantastic pop out effect that will really keep your favourite memories to life with your furry friend. 1. On the back of your chosen 12 x12 First Edition Textured card stock sheet, measure along the bottom and make a mark at each 7.6cm measurement. From this mark, score vertical lines. Measure along the left hand side and make a mark at each 10.1cm measurement and score horizontally from each mark. Place the card with the 4 sections at the top of the card and 3 sections on the side. 2. Measure 3cm out from the furthest score lines on the centre sections of your layout and make a mark. Score a vertical 10cm line from each mark, on each side centre section. Turn the card over and make two horizontal cuts from the scored lines you made. 4. Cut pieces of First Edition Wild Flower 8x8 paper sheets to fit the sections on your scrapbook layout. Place where you want them to go before gluing down. 5. Mat and layer your photos onto light coloured card from the Dovecraft A4 Card Stock to make the images pop. Adhere your photos to your layout. 6. Cut out a selection of tags and make two pockets by cutting a corner from a 7cm x 8cm piece of Wild Flower paper. Glue these pockets to the corners of your layout and adhere your tags in various spaces. 7. Die cut a selection of the elements from the First Edition dog themed die set and the photo corners from the First Edition Photo Frame die set. 8. Finish by adding any journaling you’d like included on your layout. How adorable is this layout? 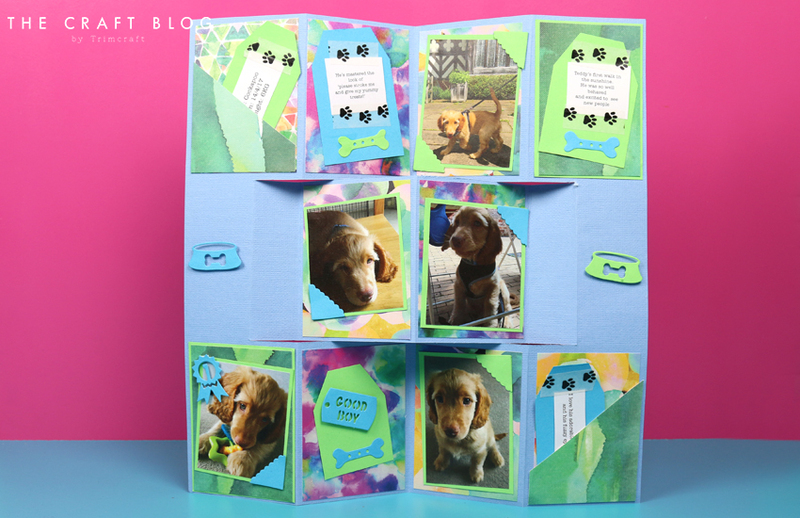 This scrapbook layout is perfect for those who want to document their dog’s growth and all of their cutest moments! We’d love to see yours so don’t forget to #trimcraft when uploading to social media and to share your makes in the inspiration area! I LIKE IT YOU CAN SHOW OFF MORE PICTURES THIS WAY AND IN DIFFERENT WAYS.